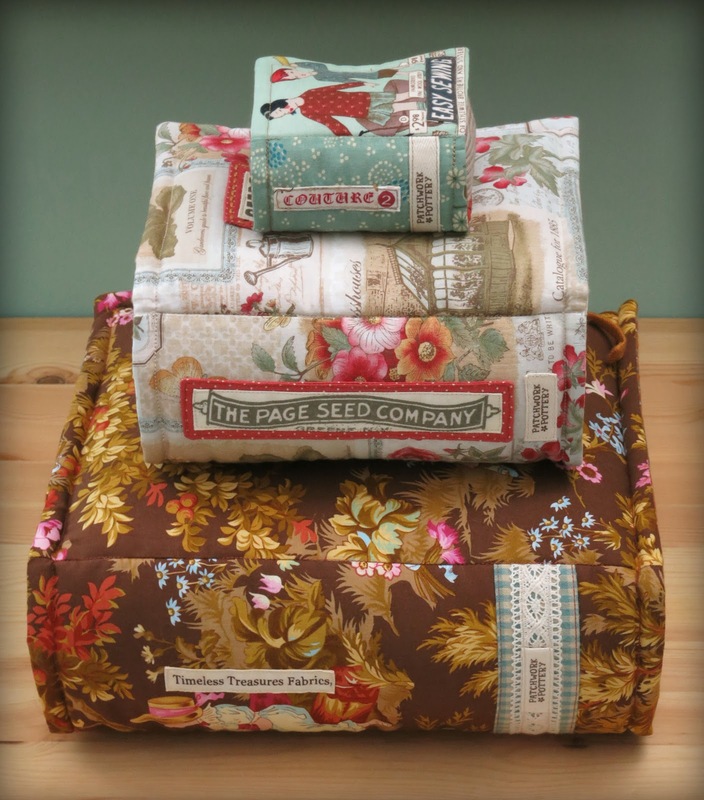 The Book Pillow & Pincushion pattern is now available in my SHOP. 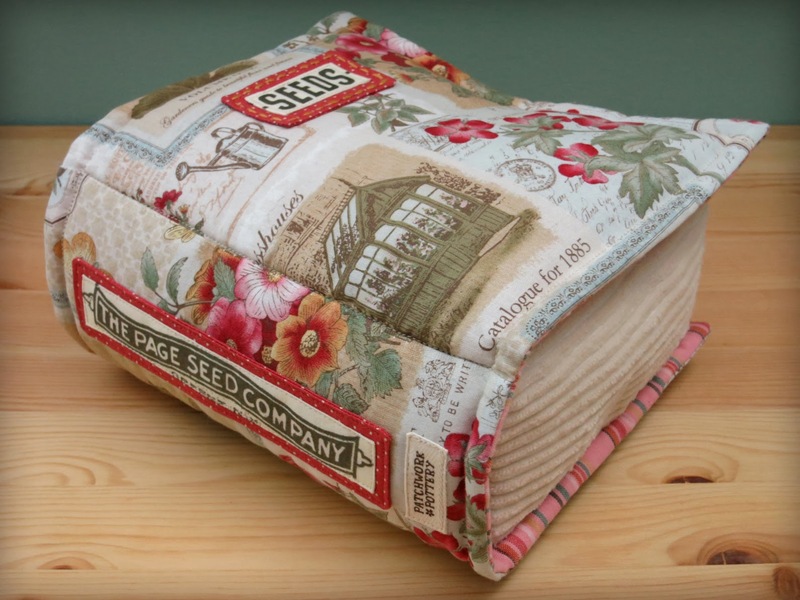 Now you can add plush book pillows to your favourite reading spot! 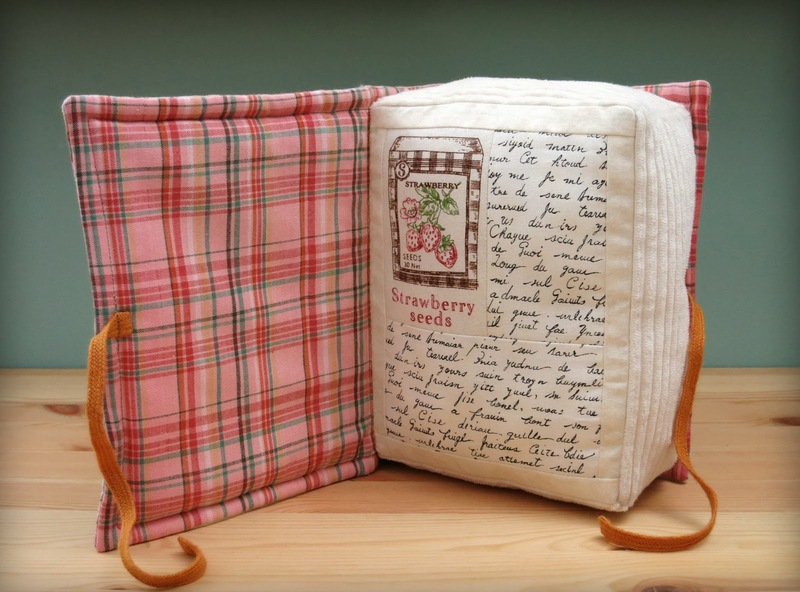 You can choose from 2 sizes of pillows with options to sew the book closed or include a secret message inside the book that you can open and read. Basic instructions on how to piece the front page and ideas for creating your book labels are given. The small pincushion-sized book has space for pins, needles inside the cover and a small spool of thread in the spine. To weight it down, you can add sand, rice or pincushion filling of your choice along with polyester filling. There is also a place for a plastic insert on the bottom to prevent pins from poking through which makes it great for travel. 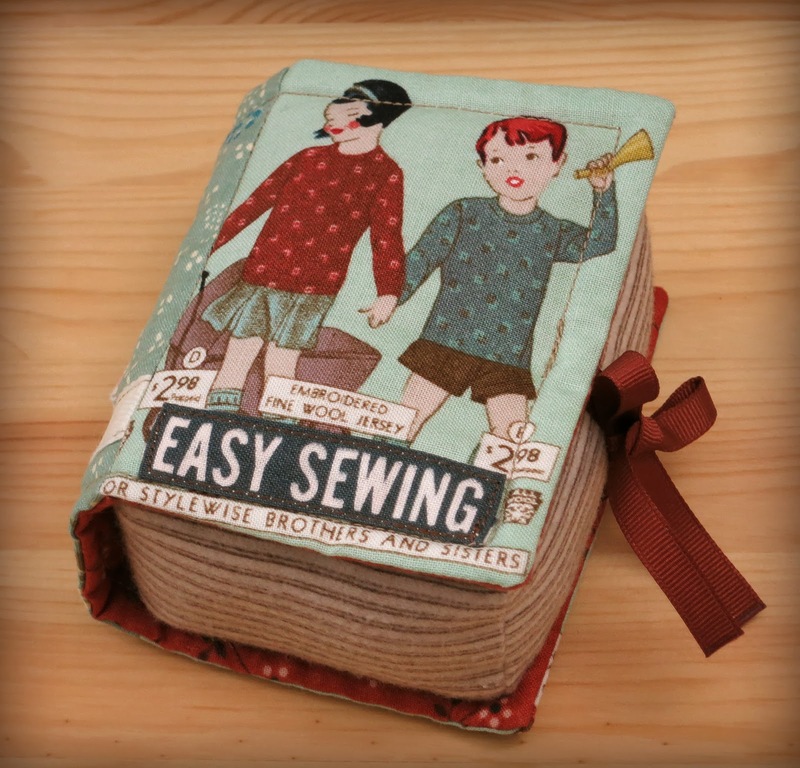 It's so cute, it would even make a great gift for someone who doesn't sew! 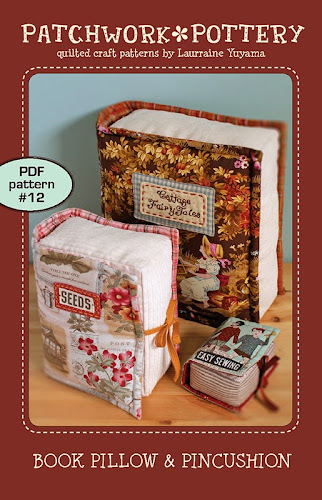 This is an 8-page digital PDF pattern containing 2 pages that make up the cover, 4 pages of instructions, 1 template page, and 1 page on how to properly print and assemble your very own pattern booklet. All PatchworkPottery digital pattern booklets include metric conversion chart, stitches & terms section, illustrated step-by-step instructions, and full size templates. For sizes and more information, please visit any of my shops. In addition to my MAIN SHOP, you can also find me on Etsy. 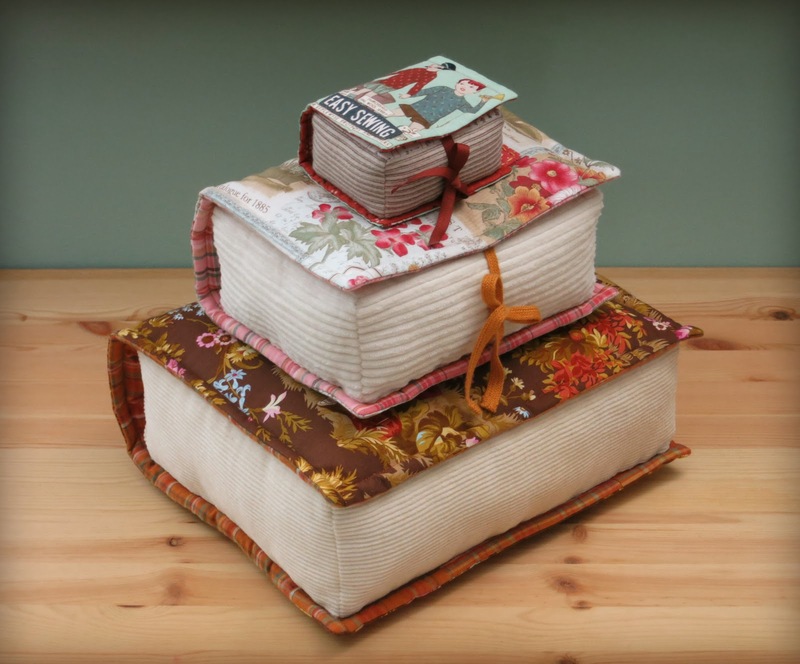 COMING SOON: Quilted Teapot and Partridge in a Pear Tree. Oh, I love the pincushion version! But first, I must make your house tape measure keeper--it took me forever but I finally have the tape measures...now to make them! These are so cute! I've been hunting for the Quilts! Baby book. I'd like to make the one little monkey quilt for my grand-daughter who is never without her monkey. Do you plan on offering this pattern? Suggestions welcome! I so adore that quilt! j'aime beaucoup la version pelotte, en coussin c'est sympa aussi et peu commun..
какая прелесть и как оригинально!!!! They are perfect Lurraine, I love your meticulous attention to detail, full of little extras! Son perfectos, me han encantado. Las telas que has utilizado son increíbles. Very cool! I like it! So cute! 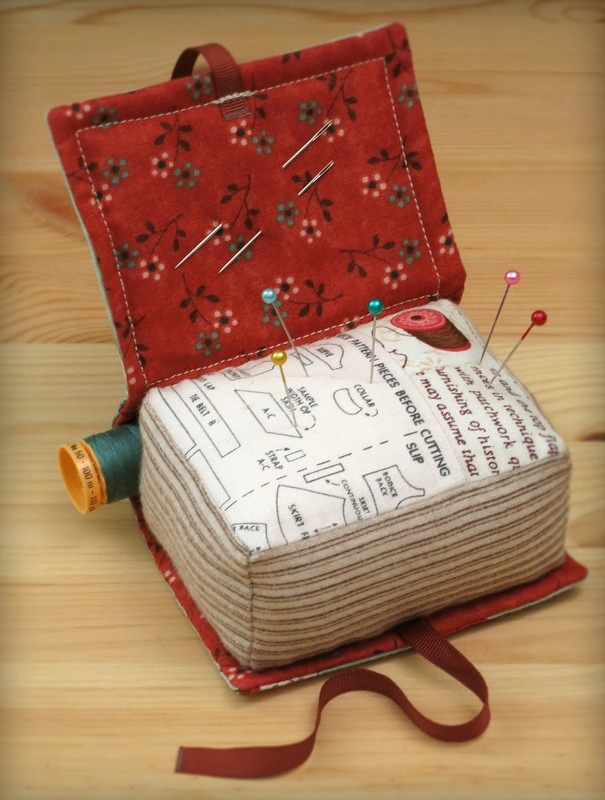 The pincushion is the best. Come visit, I will be very happy! Szeretnèm ha lèpèsről lèpèsre elkūldenèd hogy kell mès varrni. Köszönöm szèpen. so glad to see a post by you again, too! I am a long time did not know whose picture inspired me. But now I know who the author of these fine needle beds and can amend the tex messages on my blog, with your name. Thank you! I love them all. Pillows are always great. Your style is so refreshing class. Wow! 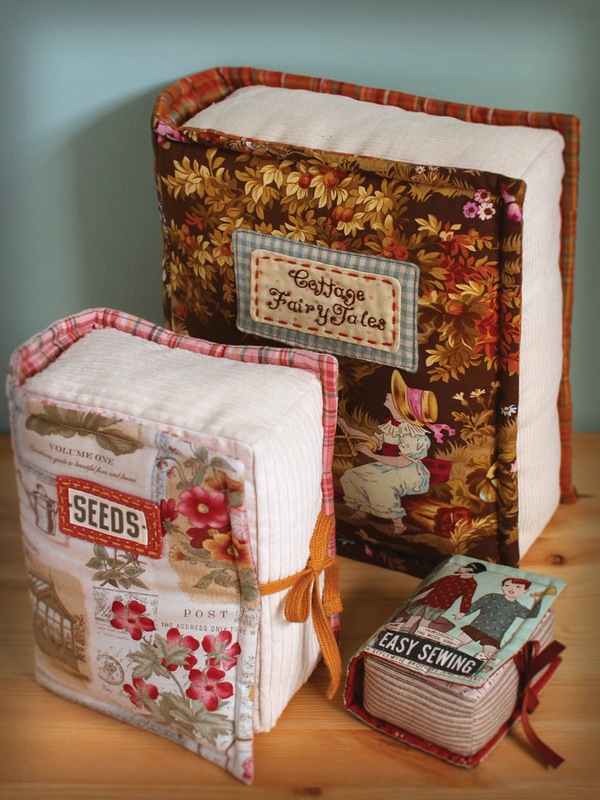 These pincushion books are simply adorable, and practical. 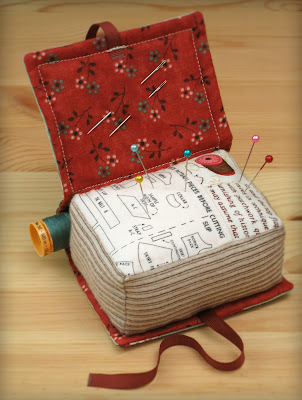 I am currently mildly obsessed with finding needlebook, pincushion and sewing notions holder ideas. This is something different. Now. 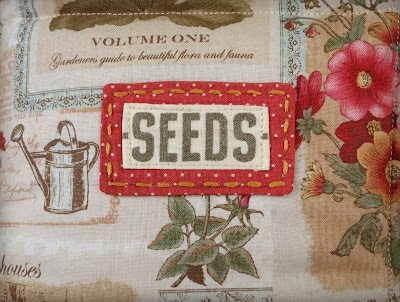 . . on to check out your Etsy shop. Thank you for sharing your creativity! What a great idea! I want a pillow book for my chair, my bed, everywhere. I've been looking for something to make to go with a "first lines of great novels" mug I picked up for a granddaughter and what a great idea! I'm sure I'll think of more people to gift this. Thanks for the concept and will get the pattern ASAP.